The environmental impacts of diuron have generated growing interest in remediation methods to prevent the potential threat of diuron to ecosystem integrity and human beings. Here, a simple and effective nanocellulose-based biocomposite coupled with Arthrobacter globiformis D47 as a herbicide degrader is presented for the rapid elimination of diuron. 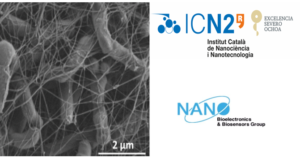 First, bacterium D47 was immobilized on the fiber networks of the nanocellulose, forming a bacteria-decorated nanocellulose (BDN) that outperformed direct utilization of bacterial suspensions for diuron decomposition. More importantly, the advantageous features of BDN could remarkably broaden its applicability since the bio-hybrid material rapidly degraded diuron and its major metabolite 3,4-dichloroaniline at low concentrations (1∼10 mg L-1). In addition, the morphology of BDN revealed the excellent biocompatibility of nanocellulose as cell scaffolding for bacterial proliferation. Then, the adsorption capacity of the nanocellulose and the enzymatic metabolism of the bacteria were validated as a joint mechanism of the BDN biocomposites in the removal of diuron. In addition, the wide applicability of BDN was further verified by the degradation of diuron in environmental matrices and other phenylurea herbicide targets. Therefore, the novel microorganism-immobilized nanocellulose composites provide a promising alternative material combining functional microorganisms with emerging nanomaterials, which may facilitate the bioremediation of organic xenobiotic pollution in complex environments.